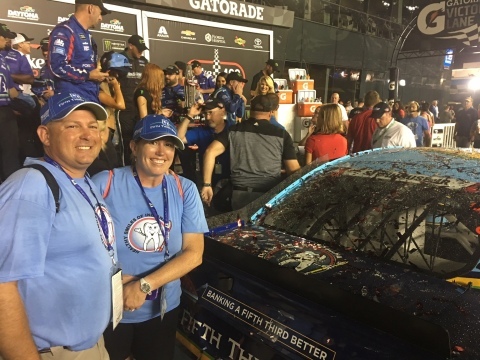 CINCINNATI--(BUSINESS WIRE)--Fifth Third Bank is offering small business owners a chance to have their company’s logo featured on a NASCAR car through a contest that kicks off today. The winner of the Fifth Third Bank What Drives You Small Business Contest, which runs through May 6, will see their logo on Ricky Stenhouse Jr.’s No. 17 Fifth Third Ford at an upcoming race. Customers and owners can nominate small businesses online in recognition of the way they serve their communities and push for excellence. The public will pick a winner from the top three nominees in late May. One lucky business will be selected to have its company logo featured on the Fifth Third Ford during the Coke© Zero Sugar 400. Held at Daytona International Speedway© on July 7, the race is one of NASCAR’s most anticipated events of the year. The winner and a guest also will receive a VIP experience at the race, including airfare, hotel accommodations, pit box seating and a chance to meet Stenhouse. The winner also will receive a $1,000 MasterCard gift card and the actual part of the race car where the winner’s logo is displayed. Indiana-based Healthy Smiles won the contest in 2017 – and Stenhouse won the race that featured the Healthy Smiles logo. Owner Chad Matchett got to visit the winner’s circle. Companies with fewer than 100 employees in the Bank’s 10-state footprint are eligible to enter. Voting criteria include three questions: What drives you to succeed? How are you improving the lives of those in your community? What would it mean to your business to win this contest? Nominations may be submitted through May 6. Public voting will take place May 18-24; the winner will be announced in late May. Fifth Third Bank is offering small business owners a chance to have their company’s logo featured on a NASCAR car.